I try to keep up on major legal developments, especially those that are relevant to my practice as a motorcycle accident lawyer in California. But as for the world of high finance, eh, not so much. In fact, I haven't read the Wall Street Journal with any regularity since I was an economics major in college. And even then I was not a fan. But today, a fun little article somehow found its way into the 'Journal and onto my computer screen. The story is about Michael Quinn, some big shot at a bi-coastal marketing company called CreativeFeed. The guy apparently spends half his life in New York City, and the other half in the San Francisco Bay Area — he has an office in the city, and a home in Sausalito (Marin County). I'm sure you're asking, so what? Well, the article is focused on his love for riding motorcycles, and in particular, his recent participation in the Dakar Rally. 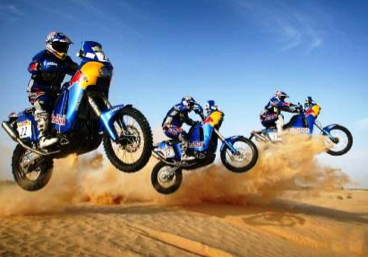 If you've never heard of it, the Rally originated in the 70s as an off-road race of motorcycles, cars, and other vehicles, that started in Paris, France, and went all the way to Dakar, Senegal (Africa!, if you were wondering where that is). In 2009 the race moved to South America's Atacama desert. As for Mr. Quinn's favorite rides? He names a few, including the PCH, and the Lake Berryessa Loop, which twists and turns through northern California's wine country. If you have a minute, check out the WSJ story. It's a nice reminder that the love for riding motorcycles cuts across economic and racial boundaries, from marketing executives and CEOs to boiler makers and steel workers, and yes, even to a few lawyers out there. Ride safe.